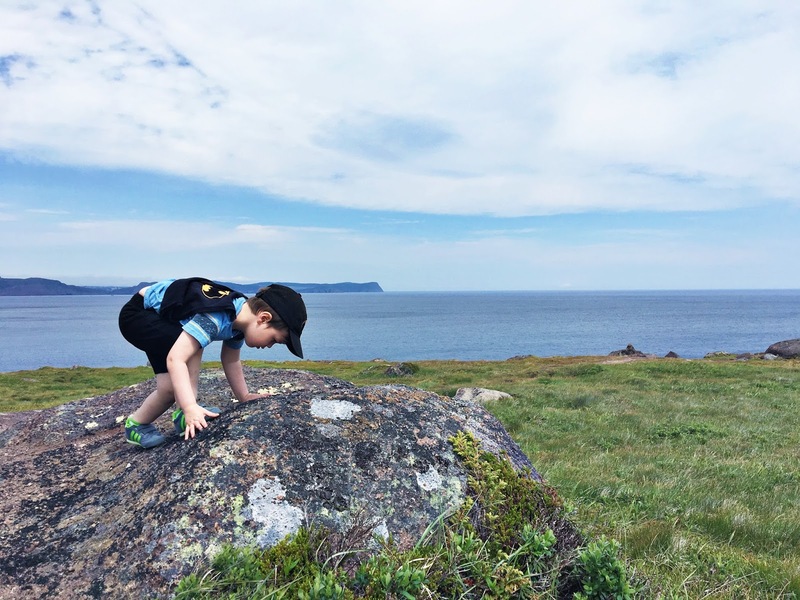 It was mid July when we decided to get up on a Saturday morning and explore Cape Spear. Ahem. Rewind. My husband actually suggested this short adventure. Now. My husband is amazing in many ways but to say he has a "get up and at 'em attitude" would be completely out of this world. 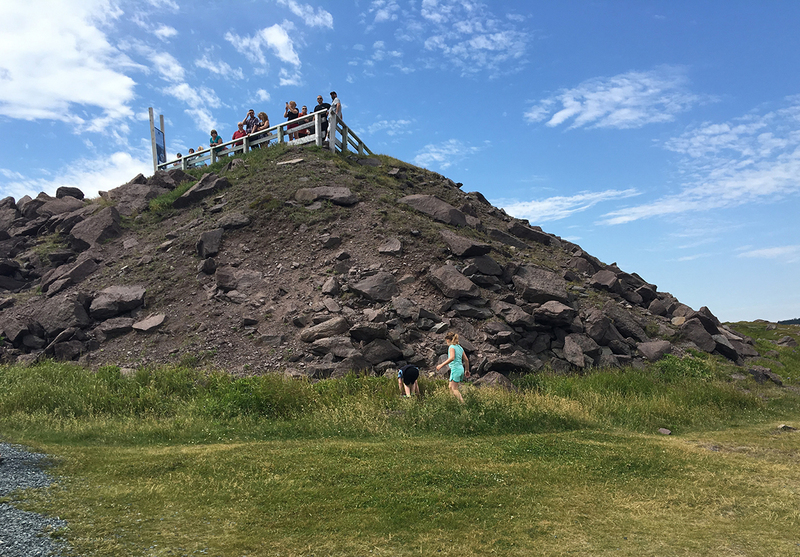 "Let's go to Cape Spear." He said. "Where can we go today, do you think?" Coming just back from work - now being 10am. I wanted to just sit down with a coffee. But I was silenced. A deer caught in head lights. ...shhhhhh. Nobody. Move. Let's see if he says it again..
"We don't have anything until when?" ... could this be real life? "Well, I suppose we can go to Cape Spear if you want to. We have a birthday party at 2pm and we have a Butterfly release at 4pm at Bowring Park." 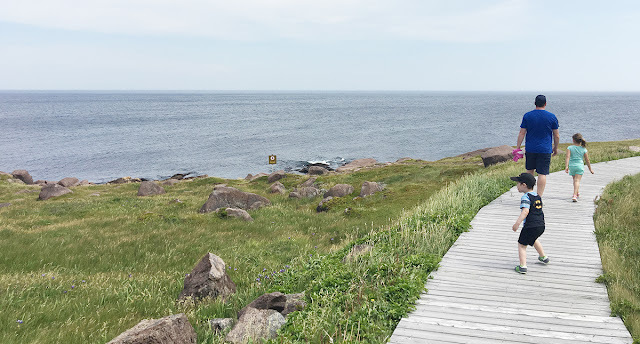 For those who don't know, Cape Spear is the most Eastern point in North America. I am not here to tell you a history lesson because quite frankly, I did History in French by perhaps a lack luster teacher who only made me memorize words out of a book rather than force me to actually learn... I just don't know the answers. Today was the day to go to Cape Spear. The whales were everywhere. We saw them close and we saw them far. Of course, not caught on camera. I will send you a link though of someone else that caught them on video on the same day. It never gets old. Not this kind of beauty. Like many parts of Newfoundland you can be sure that weather can be a big factor in your experience. But no amount of weather can stop you from feeling the energy of this place. I am just if you capture it in a bottle that #darknl would never happen. If you are like me, the thought of having my three year old unpredictable "Batman" near the edges of any cliffs will bring my heart out of my chest. The laws were laid: "STAY ON THE PATH". Hey. Hey. Hey. Kid. Kid. Jack. Jack..
"What did we just say?" Easier said then done. But I was born for this challenge. Bring it kids. I can already see my mini me dragging Jack back onto the boardwalk in between cartwheels and the Husband not seeing a thing. 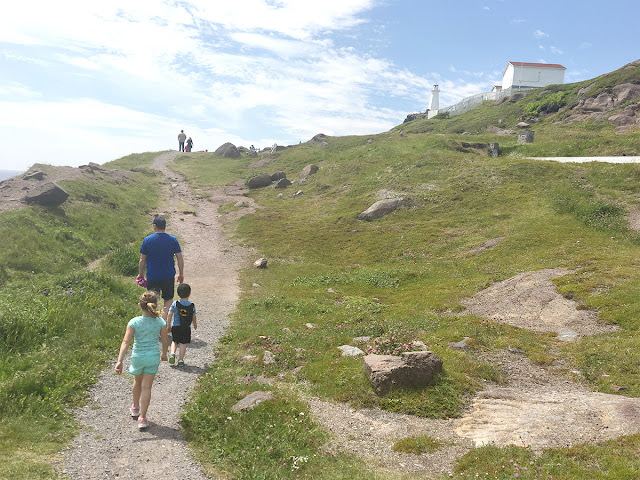 We started our hike by travelling towards the Atlantic Ocean from the parking lot where we could point out Signal Hill. We followed the boardwalk and the dirt trails while watching the whales dancing in the distance. Quite literally. We saw five at the same time as we walked in. We stopped at the look-out where crowds are often gathered looking for sea creatures. Today they found plenty and you could feel the excitement. The whale lost their appeal as it seems waiting 10 seconds between blasts of water bellowing out of their spouts was too long. As you go around the hike you end up in the entrance of the old jail. We climbed the canons and went inside as far as you could. At one time, you could walk through a short path of this dark and grungy place but it's locked up now.... and well, thank goodness... I am 34 years old and am still scared of the dark. That can be our secret. Shh. Regardless, its like there's a tingle in the air... like you can feel the spirits and the magic, most certainly you can feel the heros and the sorrows that occurred. Right now, I am just here for the party. "Party. Party. Party." The Husband would say. Following the path to the lighthouse. Warning!! Warning!! Watch out Mommies - there's lots of stairs here so leave those strollers behind. Batman was slow as molasses - Still, there was no complaints from him or any person on the path behind us. Let's get real here - they were all thankful for a reason to go slow. At the top of the hill, we saw photographers everywhere but what was most intriguing was an older lady from Parks Canada blowing a whistle indicating to all the fools to move away from the edge. No one listened so I am not sure why she is there - that was highly entertaining. We sat at the top and looked all around then slowly made our way to the larger building. There's a snack place and a craft store if that's what turns your crank but with two kids I ran away. Back down the wide steps. Slow and steady Batman. This kid is my style. He's a "Mosier". On the contrary, Jane is doing cartwheels on every platform. I didn't stop her - there's lots of room to be yourself here.